A gentle breeze is rustling the leaves along a pleasant, small-town avenue, adding further vibrancy to their already dazzling colours. Passers-by are taking selfies against this shimmering, seasonal backdrop of crimson, bronze and moody beetroot red. It looks like a scene more akin to New England in the US – until a flock of screeching, snow-white cockatoos flies past, shattering the illusion. It’s April – the Antipodean autumn – and I’m in Katoomba, a country town in Australia’s Blue Mountains national park. 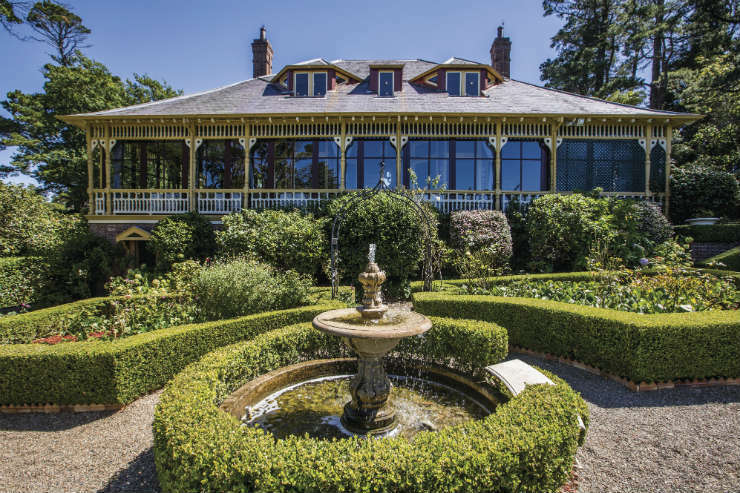 With easy access by road and train, Katoomba and its neighbouring villages are just two hours from central Sydney, making this a favourite weekend getaway for Sydneysider. Having just spent a few days ticking off Bondi and the Opera House, I’m ready to join them and complement my city break with a country escape. "The viewpoint gives onto a panorama of broad, wooded valleys, above which rise the vertical flanks of surrounding sandstone escarpments"
I’m doing so in style, too. As the area’s only five-star hotel, my home for the next few nights, Lilianfels Resort and Spa, is the Blue Mountains’ upscale guest accommodation. The property comprises an original 1890s villa (home to a fine-dining restaurant) and a modern brick extension containing the rooms and other facilities. Interiors throughout are classically grand: my room has brass bedsteads and heavy drapes framing picture windows with national park views. Lilianfels is on the edge of Katoomba, a good 15-minute walk to the centre, but this location puts it adjacent to Echo Point, the region’s signature sight. The viewpoint here gives onto a panorama of broad, wooded valleys, above which rise the vertical flanks of surrounding sandstone escarpments. Eucalyptus forest stretches unbroken as far as the eye can see, watched over by the Three Sisters, a distinctive rock formation steeped in Aboriginal folklore. The downside of such gorgeous scenery being so easily accessible is that Echo Point can sometimes be overrun with coachloads of day-trippers. Fortunately, Lilianfels remains a peaceful haven throughout. Better still, staying here overnight gives clients the chance to soak up this natural splendour early or late in the day, when it’s blissfully crowd free. Staying locally also lends itself to the early start required to beat the crowds at Scenic World, Katoomba’s headline attraction. 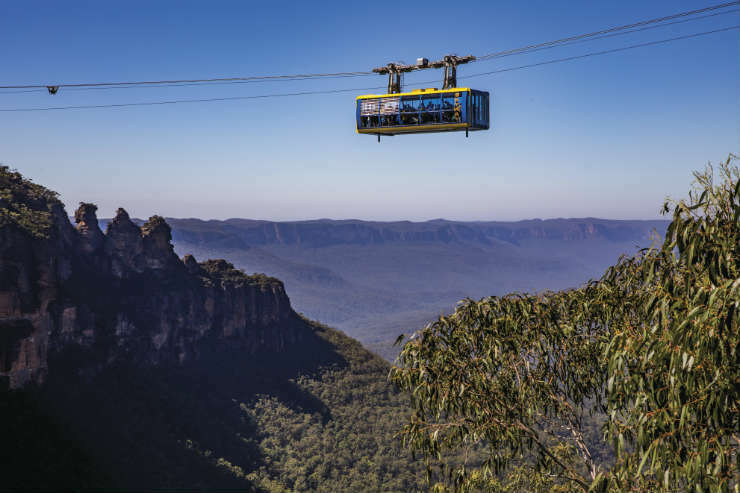 Three rides – a cable car, a glass- floored “skyway” and the world’s steepest passenger railway – connect the cliff-top lookouts to the valley floor’s temperate rainforest, allowing clients to really interact with the Blue Mountains’ scenery. At peak times (and especially at weekends) it can feel a bit like a theme park, so arriving early is essential to avoid queuing for the rides. To make the most of my Scenic World visit, I walk there from Katoomba along the Prince Henry Cliff Walk. It takes around 45 minutes to reach the Scenic Skyway, which I board for the ride to the visitor centre and onwards by cable car down to the valley’s elevated boardwalk. “Oohs” and “aahs” from my fellow passengers accompany the descent. Admission includes unlimited rides so clients can zip around as much as they wish, and there’s even an option to hike back via the Giant Stairway’s challenging 980 steps. 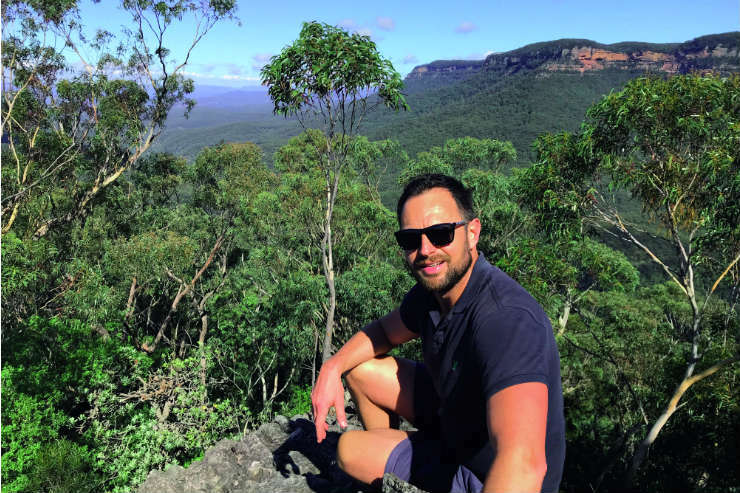 "The trail leads me through towering stands of eucalypt and banksia trees, with tree ferns forming an elegant understory"
Hiking, in fact, is a huge part of the Blue Mountains’ appeal, and the Katoomba area is blessed with some of the region’s most scenic trails. These include plenty of shorter stretches such as the kilometre-long Three Sisters Walk, plus longer tracks that active clients can piece together into more challenging full-day adventures. I opt for the latter and set off down a cliff-side staircase to the Federal Pass, following a bushwalking map that I buy at Echo Point’s visitor centre. The trail leads me through towering stands of eucalypt and banksia trees, with tree ferns forming an elegant understory. After the crowds at the tourist hotspots, the trails are refreshingly empty. I meet only a handful of other hikers throughout the day. It’s just the kind of peace and quiet I’d wanted from my country escape. Autumn and spring in the Blue Mountains offer ideal conditions for hiking, as summer can be punishingly hot and winter surprisingly cold. All the same, I’m pretty worn out by the time I ascend the cliffs via scenic Bridal Veil Falls to Leura. I’m ready to refuel on the village’s high street of quality shops and eateries. Fortunately for my weary feet, it’s only 10 minutes by taxi or train from here back to Katoomba, so I find a table at a cafe and order a glass of local fizz. I raise my glass and toast my very enjoyable few days in Sydney’s backcountry. Whether clients are seeking an outdoor experience or just want to visit some mainstream attractions, the Blue Mountains certainly offer a chance to add Outback adventure to a New South Wales booking. How are the Blue Mountains doing for Austravel? so we’re delighted that this is reflected in current booking trends. You offer the Blue Mountains as escorted or self-guided tours. What clients do these experiences suit? Our Blue Mountains Overnight Tour is aimed at clients with limited time or who appreciate delving deeper with the insight provided by a guide. Those with fewer time constraints tend to favour visiting independently. What selling tips can you suggesr to help agents secure a Blue Mountains booking? The Blue Mountains fit perfectly into an East Coast self-drive itinerary. Clients can combine them with Sydney, the Hunter Valley and Port Stephens. Advise them that staying overnight means they’ll have access to the sites after the day-trippers have left. The Waradah Aboriginal Centre in Katoomba is also worth a visit to discover indigenous Australia.